Soon, the connecting passages between showrooms in Sector 17 might be replaced by dedicated corridors for emergency vehicles such as fire tenders and ambulances. 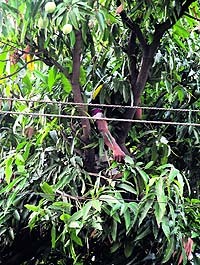 A 24-year-old youngster was electrocuted to death after he came in contact with a live electricity wire while he was plucking mangoes from a tree in Sector 7 today. The victim, Vijay Kumar, was noticed stuck in a tree branch following heavy sparking near the tree. 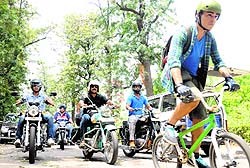 The incident took place at 6.30 pm on the road separating Sector 7 and 26 opposite Khalsa College. Vijay died on the spot. His hands and feet were severely burnt. The power supply to Sector 7 was disrupted after sparking. Following the seizure of mobile phones from two convicts inside the Burail Model Jail, UT IG (Prisons) Maneesh Chaudhery has marked a high-level probe into the matter and given directions to the police station concerned to lodge an FIR to bring the guilty to book. A 30-year-old resident of Mohali was allegedly raped on the pretext of providing her a job by the director of a private college at a flat in Sector 51, Chandigarh. In a matter of grave concern for parents and guardians, the practice of oral contraception without medical advice is on the rise in the city. Consumption of polythene led to the death of six cows during the last ten days at the cowshed on the Mansa Devi Temple complex here. During the post-mortem, doctors found about 30-40 kg of polythene in each carcass. Is City Beautiful sitting on a tinderbox? Before the result for election to the Chandigarh Lok Sabha seat were announced, Kirron Kher was quite active on social networking sites like Twitter and Facebook. She was regularly posting updates related to her election campaign. But after being elected as the MP from the city, Kirron Kher has hardly posted any update. She did not even post anything related to the Sector 17 inferno, which claimed lives of two firemen. Issue of stray dog menace was raised during an executive meeting of the Federation of Sectors Welfare Association, Chandigarh (FOSWAC), held at the community centre in Sector 21 here today. 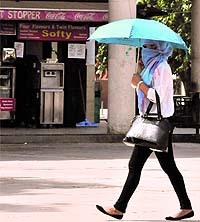 City residents will get respite from the heat as the mercury is expected to fall and there are chances of the city witnessing rain next week. The weathermen said there were chances of more rain during the next week. From Monday onwards, the weather would become partly cloudy and it would turn generally cloudy around Wednesday with possibility of rain and thunderstorm. The week-long solo theatre festival concluded at the Punjab Kala Bhawan here with the staging of a play, “Upperli Manzil”. The festival was organised by Citi Entertainment Network and Theatre Arts, Chandigarh. The World Elder Abuse Awareness Day was observed at the Senior Citizens Home in Sector 43, Chandigarh. Neil Roberts has been chosen as the chairperson of the Child Welfare Committee, Chandigarh, which was reconstituted today as term of the previous committee ended. A quarterly executive body meeting of the Senior Citizens’ Council, Haryana, was held at the day care centre in Sector 15 here today. How many more suicide cases will it take to make the Panjab University (PU) authorities act on the recommendations made by the special committee constituted after the suicide by a BDS student. As many as 3,950 candidates from different parts of the country appeared for Combined Entrance Test (CET) of fifteen postgraduate courses at Panjab University today. Dr Vishal Sharma, Assistant Professor, Panjab University, would present his research work at the 4th International Colloids Conference at Madrid (Spain) on June 17. The Gurukul’s summer school project, “The Whoopee Interlude”, culminated with exhilarating fun-studded performances by participants marking the end of the fortnight-long summer workshop at the school premises in Sector 20 here. The Mohali administration will be spending Rs 2.5 crore on uniforms this year, which will be provided free of cost to needy school children. A summer camp organised by SMD Little Champ Smart School concluded today with cultural bonanza. The Mohali police today arrested a man for abetment to suicide after his wife consumed an acid to end her life here. The UT police arrested 88 persons for consuming liquor at public places. A motorcyclist was crushed to death by a truck at the Sector 25/38 light point on Saturday night. Mohali, June 15 The body of an unidentified man was found on the railway tracks near Jagatpura village here today. The UT police issued a challan to a youth for unauthorised use of red beacon atop his vehicle. A 24-year-old domestic help allegedly committed suicide by hanging herself from a tree in a park adjoining the residence of his employer in Sector 18 on Saturday morning. Jaskeerat Singh of Delhi Public School, Sector 40, Chandigarh, won the Open (U-15 years) while Tarini Goyal of Sacred Heart School, Sector 26, claimed the girls’ (U-15 years) title on the concluding day of Chandigarh Open (U-15 and U-7) and girls’ (U-15) Chess Championship, at St. Xaviers’s Senior secondary School, Sector 44, here today. The cricket team of Panchkula District Association (U-19) reached in the semifinals of the ongoing Haryana State Inter-District Cricket Championship. 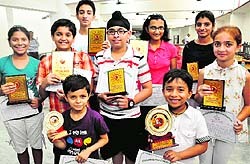 The Chandigarh Table Tennis Association announced its annual sports calendar during the annual general meeting. It also elected Sukhmeet Grewal and Harish Kumar Kakkar as the president and the honorary secretary, respectively. Harleen Kaur defeated Shamita Yadav (6-1 and 6-0) to win the girls’ open category final on the concluding day of the Total Tennis Academy’s Circuit Tournament here.